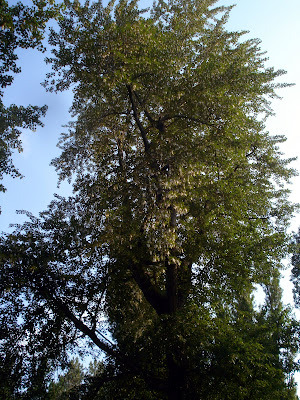 Perhaps the most distinguishing feature of this group of trees [in the poplus genus] is their cottony fruits that fill the air and water around them in early spring. 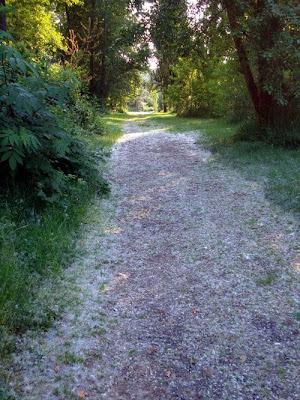 Back on May 29th as we were walking at the Tacoma Nature Center on a pathway around Snake Lake, we saw many white fluffy things floating down from the sky in a way that was reminiscent of snow. We figured they were seeds of some kind, but weren't sure where exactly they were coming from. Then a couple days ago at Fort Steilacoom Park in Lakewood, we saw the white, fluffy "snow" again. 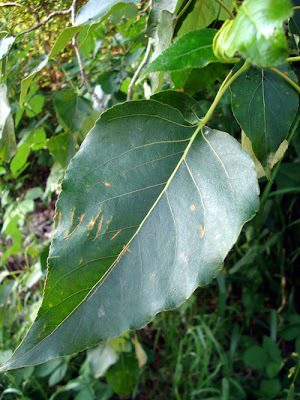 We became really curious to know where it was coming from, so I looked on the 'net and determined that it must be falling from a type of tree called a black cottonwood (populus trichocarpa) -- also known as western balsam poplar or California poplar -- a tree that is native to our area. 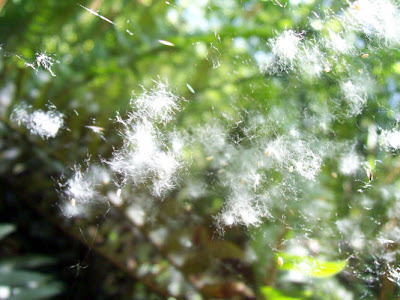 The fluff is the way the trees spread their seeds, kind of like dandelions! 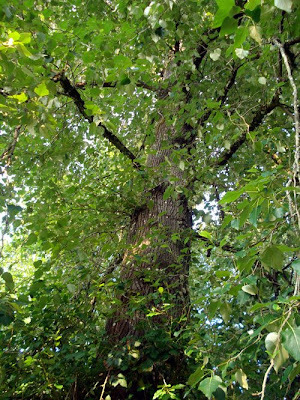 The seed ripens and is disseminated by late May to late June in Oregon and Washington, but frequently not until mid-July in Idaho and Montana. Abundant seed crops are usually produced every year. 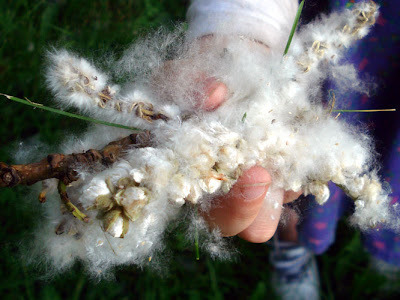 Attached to its cotton, the seed is light and buoyant and can be transported long distances by wind and water. 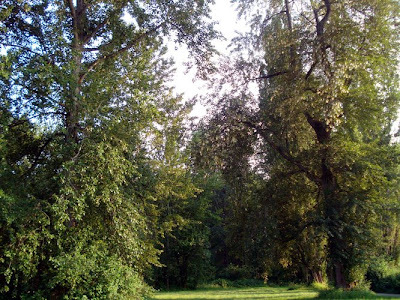 We went back to Fort Steilacoom Park yesterday on a mission to see if we could find out for sure if the fluff was coming from black cottonwood trees. 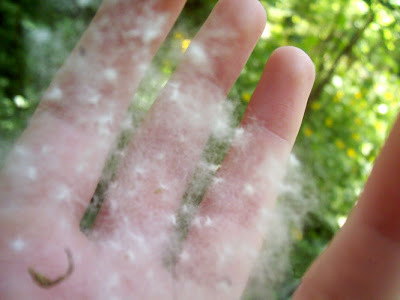 After searching around, it really seems that there are black cottonwood trees at that park and that the fluff is indeed coming from that type of tree! These were taken by me on 10 June 09 at Fort Steilacoom Park. 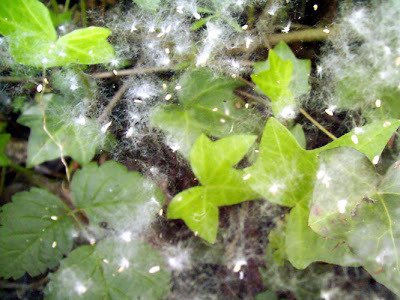 The reason they are called "cottonwood" trees -- Windchime collected a bunch of the soft fluff and made this ball. 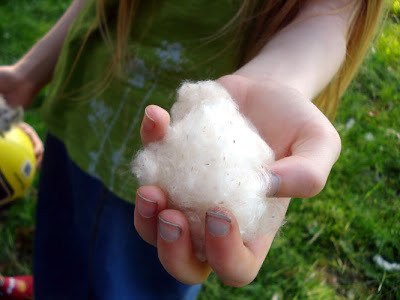 It looks a lot like cotton, doesn't it? 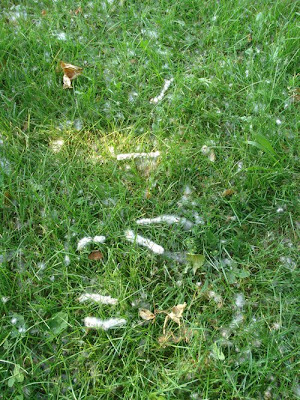 "Snow" (fluff from the black cottonwood tree) on the ground! 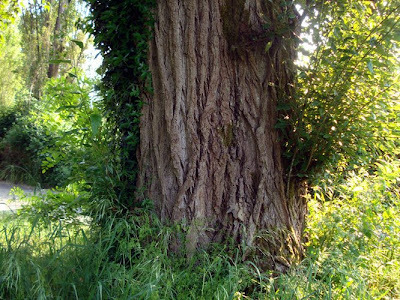 "The bark is grey and covered with lenticels, becoming thick and deeply fissured on old trees." "Furrowed and ridged on mature trees." 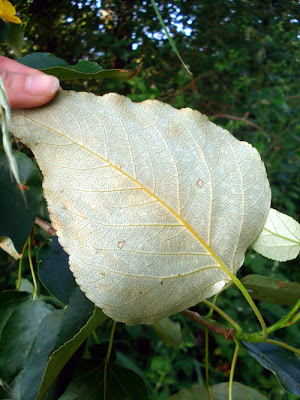 "The leaves are 7-20 cm long with a glossy dark green upper side and glaucous light grey-green underside. 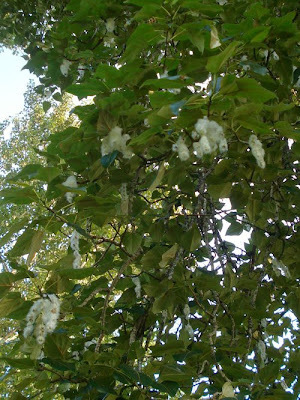 . ."
"The leaves of Populus [the genus of which the black cottonwood tree is a member] tend to have silvery or white backsides, and very long leaf stems, which makes it apparent when the wind is blowing through them." "Simple, alternate, deciduous. Triangular; 3"-6" long (but sometimes much larger); green above and white below, often with rusty markings. Margins are smooth or with rounded teeth." This is quite magical, just as I imagined it would be when I wrote my story. I have not consciously seen photos of cottonwoods that I can remember but these are just beautiful. I am so glad to have viewed this site. Thank you for your kind words. I'm so happy you both enjoyed the pictures. It does look magical, doesn't it? I can't believe I've lived here for so long and this is the first year I've given it much attention. I'm realizing that there are so many beautiful things around us, if only we look.